Whilst we were brainstorming for our Secret Santa gift ideas, my son mentioned a fun game that some of his friends had recently played. We had already selected 4 great presents to feature, but wanted something fun and little bit different to fill the fifth spot. 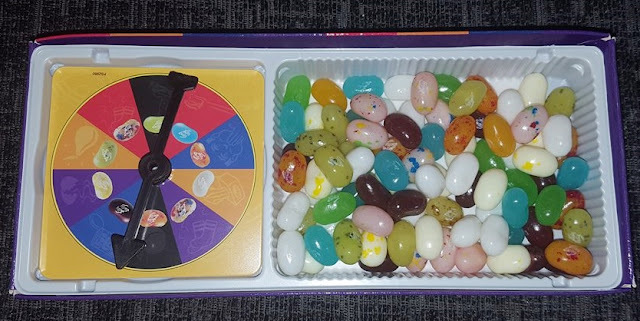 The game in question was Bean Boozled Jelly Beans by Jelly Belly, and I immediately thought how fantastic, a game involving sweets, who wouldn't like that? However, my son then went on to explain that these weren't just any jelly beans, and that the game featured some very weird and wonderful flavours. Keen to discover more about this intriguing game, Jelly Belly kindly sent us a sample to try out for ourselves. When the product arrived, I was both excited and very nervous in equal measures. Peach - Peach or...........................................Vomit (This was the one I was most scared of). The aim of the game is to take a turn on the spinner and see which colour it lands on. Each of the players then pick the corresponding coloured jelly bean. If you choose the tasty flavour then you win a point, but if you choose the bad tasting flavour then you lose a point. If you want to be really skillful then you could try and practice your best poker face and pretend that you are happily munching on buttered popcorn when really its Rotten Egg, but it is definitely not easy to try and pretend that your rotten egg flavour was delicious. Not easy at all! I did try to cheat a little and smell them beforehand to see if you could tell before tasting, and you couldn't smell a thing until it was bitten into, then it became quite obvious. The great thing about this game, is that it isn't limited on players, so whether there are only 2 of you ready to play or 10, it is an inclusive game for all, the only danger being that you may run out of jelly beans, but you can buy them separately in order to keep them topped up. We watched a few funny videos on YouTube prior to playing, though I'm not sure whether this was a good idea or not, as one minute I was laughing and the next I was filled with dread as to what they may taste like, but after building myself up to it, I was ready to play! We sat down in the evening a couple of hours after eating our dinner, and the kids were already laughing before we had even began. My husband was confident that none of the flavours would bother him, and I was merely sat there wondering what on earth I had let myself in for. My son chose to spin first and it landed on blue. I was somewhat relieved by this, as the thought of a toothpaste jelly bean didn't bother me too much, but miraculously we all had correct Berry Blue flavour. Next up my daughter took her turn to spin and it landed on brown, I was quite looking forward to trying a chocolate pudding jelly bean, but oh no, as soon as I bit into it, it tasted just how dog food smells and despite my best efforts to keep my disgusted face hidden, I just couldn't do it. I quickly ran to the kitchen to grab a drink, which in hindsight I should have made sure we all had before playing. The kids were all laughing hysterically at my panicked face, which was then making me giggle too whilst desperately trying to remove the dog food flavour from my tongue. I swear I can still taste it now. I will hold my hand up at this point and admit that I excluded myself from the game when it landed on the peach colour, I just could not bring myself to try a vomit flavour jelly bean. Yes I am a total wimp, and either my kids are extremely good at lying, or they totally swerved this one and all managed to pick the correct flavour of peach again, so as of yet, none of us have had the unfortunate displeasure of tasting this one. The only one that didn't bother me too much was the toothpaste flavour as this just tasted like the pink drink you have at the dentist, although it was rather strange having it in sweet form! 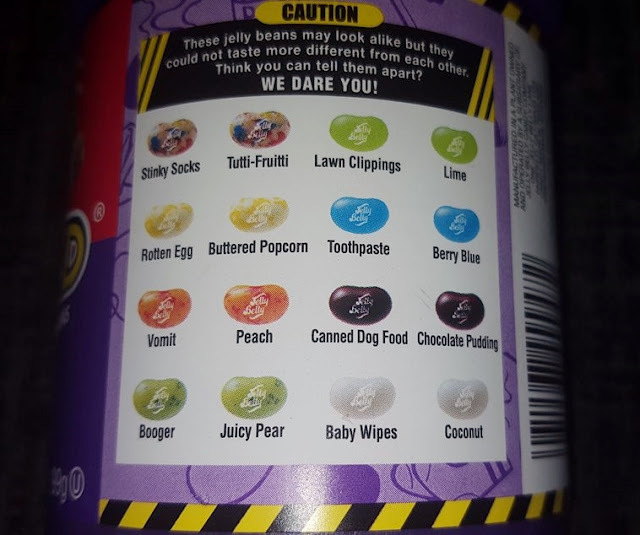 The game is great fun both for families or groups of adults and although some of the jelly beans may taste vile, they don't actually contain any vomit or dog food, and I checked the ingredients on numerous occasions just to make sure. We are planning on playing this again over Christmas when all the family come round, and I am looking forward to seeing all their faces. I played this with my eldest children who are 8 & 10, which I felt was just about the right age for children to enjoy playing but obviously this is down to parent discretion. If I was to change anything it would be to remove the vomit flavour and replace it with something less disgusting. I have a fear of being sick as it is, and so no matter how hard I tried to participate fully in the game, there was no way I could bring myself to try this one. Our version of the game was the 3rd edition, so it would seem that they change the flavours occasionally, so I would be interested to find out what flavours may be on the next edition. Disclaimer: I was provided with this product free of charge, for the purpose of providing an honest opinion and review. All opinions are my own.